Established in 1835 by European settlers from Tasmania and is the traditional land of the Kulin Nation, traditional owners are the Wurundjeri, Boonerwrung, Taungurong, Dja Kja Wurrung and Wathaurung people. Designed by local architects Woods Marsh, the ACCA building is a work of art in itself. The cavernous exhibition spaces have allowed it to host some ambitious international projects, and it’s become renowned for the quality of its programs and dedication to commissioning bold new works. Film, Tv, Video Games, Digital Culture and Art. A state-of-the-art facility purpose-built for the preservation, exhibition and promotion of Victorian, Australian and International screen content in all forms. 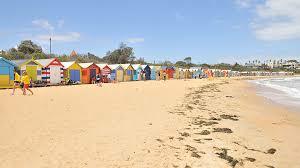 The 82 colourful wooden huts, bathing boxes, have stood for well over a century. Melbourne is the coffee capital of Australia. In the CBD, the cobblestoned laneways are filled with the aroma of espresso, wafting from the many cafes, as they serve a busy hubub of loyal customers. Further afield, Carlton, Richmond, Fitzroy, Prahran, South Melbourne and St Kilda, also offer great cafe strips, with a distinct neighbourhood feel. There are a few visual cues that mark the beginning of summer in Australia. Jacarandas blossoming on suburban streets. Cricket replacing footy on local ovals. Backpackers sunburning on crowded beaches. And big screens popping up in parks and on rooftops around the country, preparing for another summer of outdoor cinema. Because what better way to spend a balmy evening than under the stars watching your favourite flick? MELBOURNE CRICKET GROUNDS MCG built in 1853 is home to Australian Rules Football and test cricket and includes 1956 Olympics, 2006 Commonwealth Games, music concerts, soccer World Cup qualifiers, rugby league and sate-of-origin test matches. Towering 297m above the streets, provides a bird’s, eye view of the Victorian Capital from the 88th floor of the city’s tallest building. Striking murals throughout the neighbourhood, the backstreets between Brunswick and Smith Streets is particularly fertile soil for admirers of urban art. The lifeblood of Gertrude Contemporary has been the artist studios located above the gallery space. For more than 30 years, Gertrude Contemporary has been an incubator for emerging and mid-career artists, and the space allows artists and the public to engage in contemporary art that takes risks. Opened in 1934 by John and Sunday Reed, is the birthplace of Australian modernism. The Reeds opened their home (the Farmhouse) to progressive artists such as Sidney Nolan, who painted his iconic Ned Kelly series in the dining room. The 15-acre property also contains the Modernist House and a Sculpture Park. The island can be found floating under the Pedestrian Bridge, Southbank and is only accessible from stairs descending from above. With thoughtful bites to discover and drinks to savour, Ponyfish Island will become a destination for those who are hungry for something new. The largest open-air market in the Southern Hemisphere and a Melbourne institution since 1878. Is a creative project aimed at showcasing the new wave of virtual reality works. Pushing the boundries of the medium and assisting experienced content creators to create VR works. By having a VR cinema space to screen, network with other vr creators. Spring Racing Carnival each October and November bringing together the finest thoroughbreds with the Melbourne Cup on the first Tuesday of November.